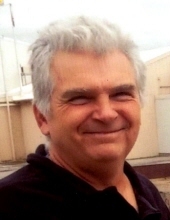 On January 31, 2019, John E. Vaia, son of the late Barbara Canter and James Vaia passed away suddenly at his home in Grass Range, MT at the age of 57. A native of Alexandria, OH, John attended Northridge High School, graduating in 1979 and continued his education at Lake Superior State University where he studied wildlife management and was a member of his college basketball team. John’s passion from an early age was always “the great outdoors” where he spent much of his time hunting, fishing, and trapping. After college, John came to Montana where he fell in love with the western skies and longline trapping. He carved out a life in Central Montana, working hard to do it. He became an outfitter and professional trapper. He was one of the best snaremen and trappers with the largest coyote catches of anyone in the Musselshell and Missouri Breaks. He later became a fur buyer. John wrote several articles about his exploits that were published in Fur, Fish and Game. John started a fencing business serving area ranchers and the BLM, building hundreds of miles of fence across the prairies. Throughout the years, John was able to “live the dream out here in God’s country” living the life he loved and creating a life for himself and his family. John is survived by his wife, Diane Vaia of Grass Range; three stepchildren: Annie (Cameron) Fraser of Lewistown, Will (Michelle) Livingston of Billings, and Elizabeth Livingston of Missoula; seven grandchildren; his father, James Vaia; sisters, Cheryl Vaia (Herb Bressler), and Annie (Matt) Cacciato; brother, Mike (Tina Bolton) Vaia; and numerous nieces and nephews. He is also survived by a trapping community that will miss him dearly. At his request, cremation has taken place, no services are planned. Memorial donations are requested to the Grass Range (QRU) Ambulance. To send flowers or a remembrance gift to the family of John Eugene Vaia, please visit our Tribute Store. Cremation has taken place, there will not be a service. "Email Address" would like to share the life celebration of John Eugene Vaia. Click on the "link" to go to share a favorite memory or leave a condolence message for the family.